My family definitely needs to have planned meals. With the kids’ sports’ schedules some days we need to have quick and easy meals (or possibly even eat-on-the-run meals), but on the days with no sports or after-school activities we prefer longer, sit-down meals and having the menu planned out a week at a time helps us make sure we aren’t missing any opportunities to do just that. Having a menu board also helps with grocery shopping as I am no longer standing in the middle of Kroger trying to figure out what I should make for dinner. I knew when I began working on a command center, that a menu board would be part of it. I wanted a large sized menu board where the entire week could be planned at once. I also wanted it to be easy to view and to update. 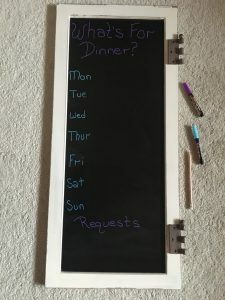 When I found this farmhouse chalkboard at Hobby Lobby I knew I had found my menu board. 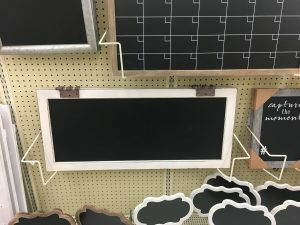 When you purchase a new chalkboard, be sure to “season” the writing surface – this will help the board to erase better which will lead to a longer life for the chalkboard. 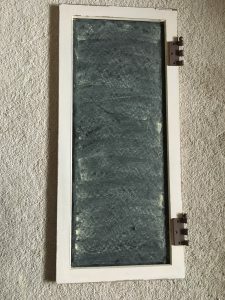 To “season” a chalkboard, turn a piece of chalk on its side and cover the entire board with chalk making sure to also coat the edges. When the entire board is covered, erase with a dry eraser or a soft cloth. Change the direction of your chalk and cover the board with chalk and dry erase again. Repeat this process 4 or 5 times. Now your board can be cleaned with a damp, dry cloth. I use Liquid Chalk Marker for the titles on my Menu Board and I use chalk pencils for adding the weekly details. I use both markers and pencils because the chalk pencil can be erased and changed using only a dry eraser, but the liquid chalk markers can only be erased with a damp cloth. The allows me to erase the board with a dry cloth weekly – without having to rewrite the days of the week or the headings or drawings. However, since I used liquid chalk markers, I am able to change the writing whenever I want by simply cleaning the board with a damp cloth. 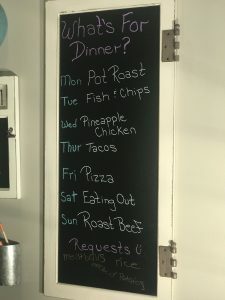 At the bottom of the weekly menu, I added a space for Meal Suggestions where family members can request a meal for an upcoming week. This space has become a favorite of my children and helps them feel like they are helping plan the meals. We are a participant in the Amazon Services LLC Associates Program, an affiliate advertising program designed to provide a means for us to earn fees by linking to Amazon.com and affiliated sites. This program results in no added costs for you. I hung my Family Menu in my family entrance on the same wall as our weekly planning calendar. Since we are using the hallway to our garage as our command center and mudroom, I have items placed on both walls. I’m positioning items in logical groupings, for example the mail bins are all together, and the planning calendar and menu board are together. I painted the walls with Sherwin Williams Functional Gray and added a couple of decorative items and now the planning side of the wall is complete. To make our hall more functional – both as a command center and as a hall – I am placing things on this side that fit closely to the wall. No bins, etc on this side. I kept that requirement in mind as I shopped for the planning calendar, menu board, and the decorative pieces I included on this wall. To see the completed planning side of my command center/family drop zone, please click here. Thanks for visiting!!! If you haven’t already, please sign up for our newsletter! !